This is the 2018 taxable value of your property. Taxable value is assessed value less any exemptions. These are the 2018 millage rates the taxing authorities levied upon your property. These are the 2018 taxes levied on your property last year. This is the 2019 taxable value of your property. Taxable value is assessed value less any exemptions. These are the 2019 millage rates if each taxing authority adopts the same budget as last year. 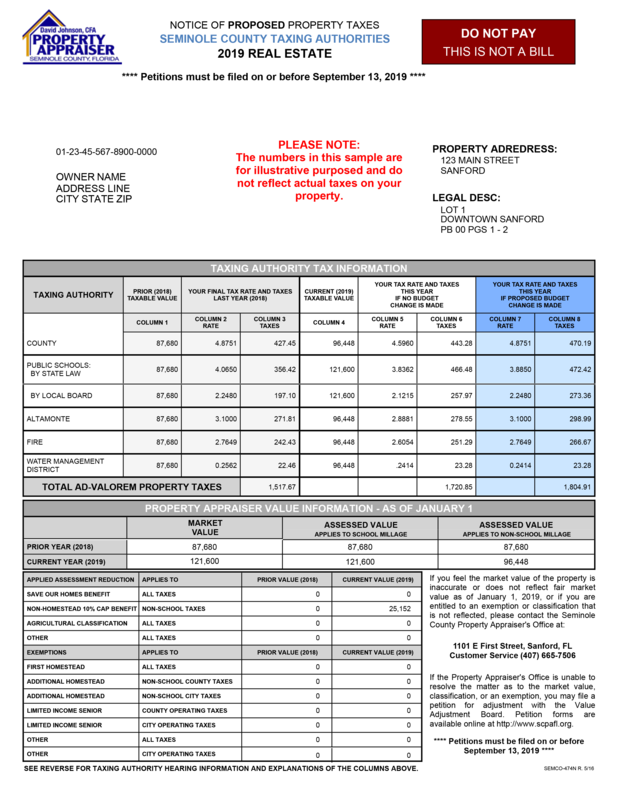 These are the taxes levied on your property based upon the millage rates in column 5. These rates are if a taxing authority adopts the same budget as 2018. These are the proposed 2019 millage rates by the taxing authorities. If the proposed budget is approved during final hearings, these will be the millage rates shown on your 2019 tax bill. These are the taxes levied on your property based upon the proposed millage rates in column 7. If the proposed budget at the final hearing is approved, these will be your taxes due. These are the local authorities that levy taxes in Seminole County. This is the physical address of your property. This is the written description that defines your property’s boundaries and its location in Seminole County. This is the unique identification number assigned to your property. This is the most probable sale price for a property in a competitive, open market involving a willing buyer and a willing seller. This value is for real estate tax purposes only. This is the market value as limited by an assessment cap, such as ‘Save Our Homes’ or an Agricultural Classification. This is the value as capped by an assessment cap such as ‘Save Our Homes’, an Agricultural Classification or the 10% cap on non-homestead properties. Since the 10% cap does not apply to school millages, there may be a different assessed value for school and non-school millages. This area lists the value of any assessment reductions such as ‘Save Our Homes’, or the 10% cap for non-homestead properties. Certain types of agricultural properties receive an Agricultural Classification and are valued at their classified use rather than their just value. If you benefit from any of these, it will be reflected here and in your assessed value. This area lists the exemptions that are being applied to your property and their value. For details on exemptions, visit our website. If you have any questions or concerns regarding the information found on your notice, please contact our office at 407-665-7506 to speak with an appraiser. The deadline to file a petition is September 12, 2016. If you have questions, please call the VAB at 407-665-7662.